If you have RLS, you know the relentless leg discomfort that can drive you out of bed at night. Chances are, you also have two other symptoms: periodic limb movements in sleep (PLMS) – 80 percent of those suffering from RLS display this symptom; and constant wakefulness or “hyperarousal” – people with RLS typically are not sleepy during the day, even if they don’t sleep well at night. Now, scientists have gained new insight into what causes these symptoms – and new avenues to investigate for treatment. 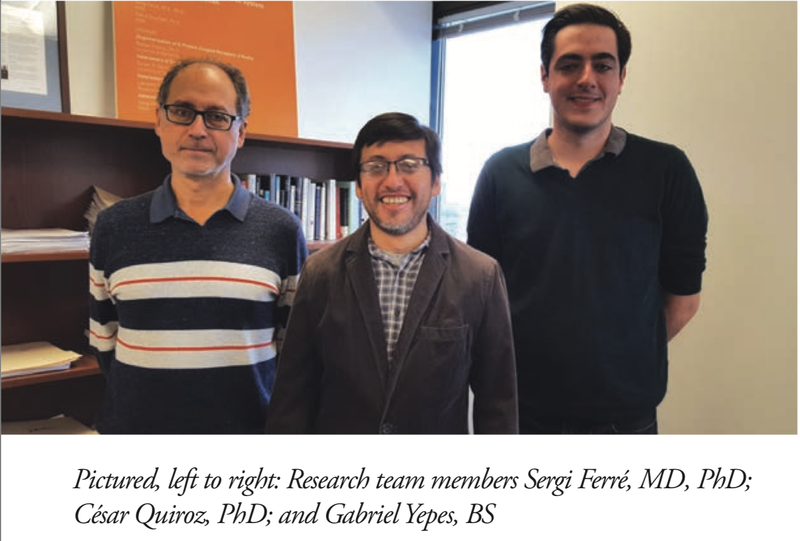 In 2014 and 2015, Sergi Ferré, MD, PhD, of the National Institute on Drug Abuse (Intramural Research Program) received grants from the RLS Foundation to more closely examine how dopamine and glutamate work in the brain. Dr. Ferré has found that low levels of receptors of adenosine, a chemical in the brain that regulates neurochemicals, lead to abnormally high levels of glutamate and dopamine. This may be the underlying cause of both PLMS and hyperarousal in RLS. The researchers have also pinpointed a subtype of receptor in the brain – the dopamine D4 receptor – as a new and better target for dopamine drug development. Dr. Ferré’s research into RLS builds on decades of science by others on the roles of dopamine and glutamate in the brain for those who suffer from RLS. It has long been believed that RLS is related to a malfunction in the way the brain uses dopamine. Dopamine is a neurotransmitter (a brain chemical that sends messages) associated with muscle activity and movement. Dopamine medications for RLS act by decreasing the amount of dopamine produced by neurons (brain cells). This has the effect of reducing PLMS. However, use of dopamine medications is limited by the serious side effect of augmentation. In 2013, scientists at Johns Hopkins identified the involvement of another neurotransmitter – glutamate, which is associated with arousal (wakefulness). Researchers found elevated levels of glutamate in the brains of people who had RLS. The extra glutamate is thought to contribute to PLMS – and to hyperarousal. Many RLS patients take alpha-2-delta medications to control their symptoms by reducing glutamate levels. In the current study, Dr. Ferré’s laboratory used its first RLS Foundation grant to create an animal model that will help develop and test new RLS treatments. A rodent was fed an iron-deficient diet to mirror the brain iron deficiency found in people with RLS. The researchers invented a method that combines optogenetics and microdialysis. They attached a light-activated protein to specific neurons between the cortex and striatum in the brain of the rodent. When they shone a light on the neurons, this triggered the release of glutamate – which was greater in the animals with iron-deficiency than in animals fed a regular diet. 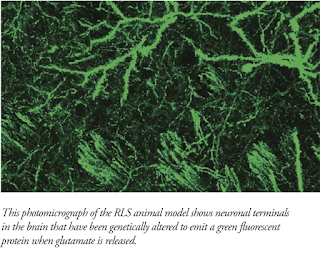 “The first finding was to show that in the rodent with brain iron deficiency, a well-accepted pathogenetic model of RLS, we were able to show that brain iron deficiency produces increased sensitivity of the cortico-striatal terminals to release glutamate,” says Dr. Ferré. Recently, Dr. Ferré’s team tested this animal model with several RLS drugs: the dopamine agonists pramipexole and ropinirole, and the alpha-2-delta drug gabapentin. The researchers validated that these medications work by counteracting the release of glutamate. If RLS medications work by reversing unusually high dopamine and glutamate levels, how could these high levels be prevented in the first place? That is the scientific question – and Dr. Ferré feels he may have found an answer in adenosine. Adenosine is a neurotransmitter that regulates the levels of other chemicals; it acts as a brake for the dopamine and glutamate systems in the brain. Using the animal model, Dr. Ferré’s team found that when there are fewer adenosine receptors (specifically of the A1 subtype), there is increased dopamine and glutamate. This links adenosine to PLMS symptoms. But there’s more. “Adenosine by the way, regulates the sleepiness associated with prolonged wakefulness,” explains Dr. Ferré. In the cortex, thalamus and other areas of the brain, adenosine modulates homeostatic sleep. Low levels of adenosine receptors could explain the hyperarousal of RLS. “The beauty of the adenosine story is that it connects the hyperarousal symptoms with movement [PLMS],” he says. This insight can be used to potentially develop RLS treatments that increase the concentration of adenosine to prevent both PLMS and hyperarousal. One such drug is already available clinically: dipyridamole, an antiplatelet drug that protects against stroke and heart attack. Dr. Ferré’s team validated dipyridamole using the animal model. He also collaborated with Diego García-Borreguero, MD, PhD, director of the Sleep Research Institute in Madrid, to trial the drug in a small group of RLS patients – with promising results. As a next step, Dr. García- Borreguero will coordinate a larger clinical trial in Europe. Dr. Ferré is also working with several research laboratories to pursue drugs similar to dipyridamole that are more potent and can more easily cross the blood-brain barrier. 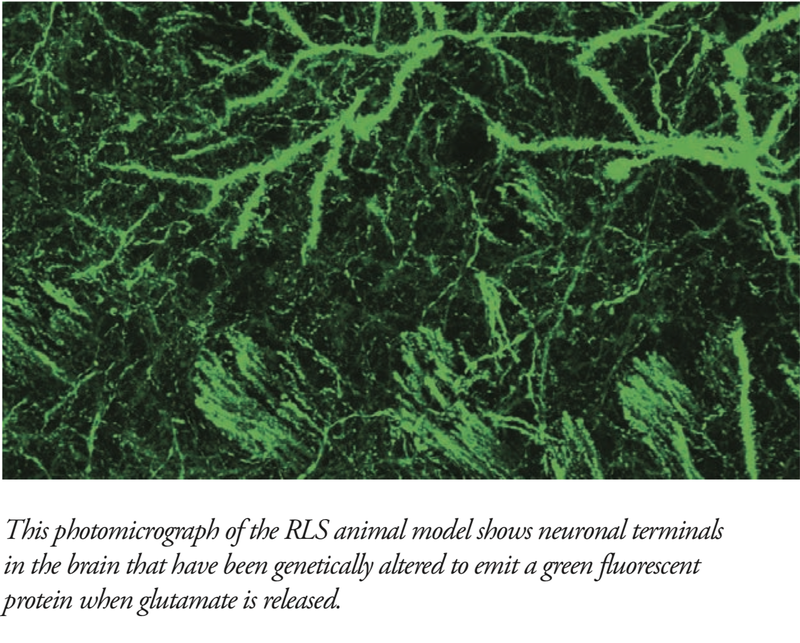 Using a rodent model of RLS, the researchers showed that people with RLS may have an increased sensitivity in specific brain cells to release dopamine and glutamate. They also found that a decrease in the concentration of receptors for adenosine in the brain may cause higher levels of dopamine and glutamate, explaining movement-related RLS symptoms – namely, PLMS. Since adenosine also regulates sleep, the low concentration of adenosine may also explain the hyperarousal symptom in RLS. Therapies that increase adenosine may help with RLS. Dipyridamole may be one, and others can be developed. The researchers also pinpointed a subtype of protein in the brain that can be targeted by dopamine medications, potentially without augmentation as a side effect. He also points to the Foundation’s role in cultivating a community of scientists dedicated to solving the mysteries of RLS who support each other’s work. Forty-four researchers have received grants from the RLS Foundation since 1997, and nine have served on the Foundation’s advisory board. Their work spans several continents and many disciplines. “Thanks to the RLS Foundation, I can connect to different specialties quickly and get their input right away,” says Dr. Ferré. 1Yepes G, Guitart X, Rea W, Newman AH, Allen RP, Earley CJ, Quiroz C, Ferré S. Dec 2017. “Targeting hypersensitive corticostriatal terminals in restless legs syndrome.” Ann Neurol 82(6): 951–60. doi:10.1002/ana.25104. 2Ferré S, Quiroz C, Guitart X, Rea W, Seyedian A, Moreno E, Casadó-Anguera V, Díaz-Ríos M, Casadó V, Clemens S, Allen RP, Earley CJ, García-Borreguero D. 2018. “Pivotal Role of Adenosine Neurotransmission in Restless Legs Syndrome.” Front Neurosci 11: 722. doi:10.3389/fnins.2017.00722. In June, the RLS Foundation visited Washington for a second round of meetings to advocate for research funding and for continued patient access to opioid medications to treat severe RLS. Led by Executive Director Karla Dzienkowski, the Foundation team met with members of Congress who are on key legislative committees that have jurisdiction over health policy, and with two groups at the National Institutes of Health (NIH). The Foundation team met with staff in the offices of Sen. Sheldon Whitehouse, D (RI); Sen. Bob Casey, D (PA); Sen. Elizabeth Warren, D (MA); Rep. Markwayne Mullin, R (OK); Rep. Conor Lamb, D (PA); Rep. Katherine Clark, D (MA); and Rep. Michael Burgess, R (TX). The discussions centered on the need for a safe harbor for RLS in any upcoming legislation or policy that might restrict access to opioid medications. “Staffers shared that over 50 opioid bills are under consideration,” says Dzienkowski. For the millions of Americans who have chronic, unrelenting RLS, opioid medications taken in low total daily doses can be very effective for controlling symptoms. The Foundation team also asked legislators to support two research priorities: $2 billion in increased funding for the NIH in fiscal year 2019; and continued inclusion of “sleep disorders” as a category eligible for grants by the Department of Defense. At the NIH, John Winkelman, MD, PhD, gave a presentation on behalf of the Foundation to the Sleep Disorders Research Advisory Board (SDRAB) of the National Heart, Lung, and Blood Institute. Dr. Winkelman is director of the RLS Quality Care Center at Massachusetts General Hospital and a member of the Foundation’s Scientific and Medical Advisory Board. The SDRAB is a federal advisory committee that sets the strategy for sleep disorders research at the NIH, and the meeting was an opportunity to highlight the unmet needs of RLS patients. RLS Foundation Board member Linda Secretan is one of two patient advocates on the SDRAB. In his presentation, Dr. Winkelman discussed limitations of RLS treatments and the importance of research, including his current study to evaluate the long-term use of opioids to treat RLS. The Foundation also visited the National Institute on Drug Abuse and met with members of the Division of Neuroscience and Behavior, which supports research on drug use and addiction. Dr. Winkelman led a lively discussion on the neuroscience of RLS and how new drug therapies might be developed to treat the disease. The meetings were coordinated by the Health and Medicine Counsel of Washington (HMCW), a government relations organization with nonprofit and healthcare industry expertise that is partnering with the RLS Foundation to guide its advocacy efforts. In addition to Dzienkowski and Dr. Winkelman, the delegation included Kris Schanilec, RLS Foundation communications; and Dane Christiansen, Dale Dirks and Peter Herzog of HMCW. The RLS Foundation is working hard to advocate on behalf of the RLS community. The Foundation needs you, an RLS patient or family member, to amplify these efforts by meeting with your legislators. You can meet with your members of Congress at offices in your home state or in Washington. Elected officials want to hear directly from their constituents, and sharing your personal experiences is the best way to educate them about the needs of RLS patients. The Foundation has resources to help you get started. Contact Peter Herzog at herzog@hmcw.org or visit www.rls.org to learn more. Delivered letters to members of Congress from 200+ individuals who responded to a request for personal stories about opioid medications and RLS. Attended Congressional meetings and hand-delivered position letters to committees that are crafting legislation related to opioid medications and/or biomedical research funding. These efforts helped support passage of the FY2018 appropriations bill, securing a $3 billion increase in funding to the NIH. Delivered 40 letters to members of the Senate Defense Appropriations Subcommittee from RLS Foundation members who responded to an Action Alert to support inclusion of “sleep disorders” on the Department of Defense Peer Reviewed Medical Research Program in FY2019. Met with 23 Congressional offices, three NIH institutes, the NIH Sleep Disorders Research Advisory Board, and the U.S. Food and Drug Administration (FDA). Coordinated or supported meetings by the RLS Foundation team and Foundation members with US senators and representatives of 13 states. Why Are Opioids Needed for RLS? About 1 in 33 Americans – 3 percent of the US population – has RLS that is severe enough to need daily medical treatment. Unfortunately, treatment options are limited, and FDA-approved medications for RLS often have serious, long-term side effects. When all other options have failed, opioids at low total daily doses are an established, highly effective treatment option for people with RLS. Clinical experience among experts has not shown the degree of drug misuse, dependency or addiction commonly associated with opioid use to treat chronic pain. The RLS Foundation actively conducts educational outreach to help ensure that healthcare providers know how to diagnose and treat RLS, including appropriate use of opioid medications. For more information, visit www.rls.org. Decision makers at the FDA are requesting comments by September 10, 2018 from patients who utilize opioid therapies to manage their chronic conditions. Agency officials want to hear from refractory RLS patients on how they manage their condition and barriers that are affecting their access to treatment. On Monday, July 9th, the Restless Legs Syndrome (RLS) Foundation participated in a Patient Focused Drug Development (PFDD) meeting hosted by the FDA. The goal of this meeting was to incorporate patients’ voices as the agency develops guidance on opioid therapies for chronic pain, refractory RLS, and other conditions that utilize these treatments. RLS is not considered to be a chronic pain condition, because its underlying mechanisms and neuropathology are very different. The Foundation urged regulators to appreciate the differences. This is why it’s important for the RLS community to take part in these discussions, because the perspectives shared will inform the FDA’s decision making on regulations that will affect refractory RLS patients who utilize low total daily doses of opioids to manage their condition. At the July meeting the FDA welcomed input from a variety of people using opioids to manage chronic conditions. The FDA is now seeking input from patients who were unable to attend in person. Written comments will add weight and depth to the presentations made at the meeting. Given the high level of concern about opioid related deaths, it is critical that RLS patients make their voices heard at this crucial moment in the policymaking process! In response to these questions, always make sure to note that RLS is different from chronic pain and requires any regulations or legislation take this difference into account. Now is your chance to speak up, to share your experiences and frustrations. 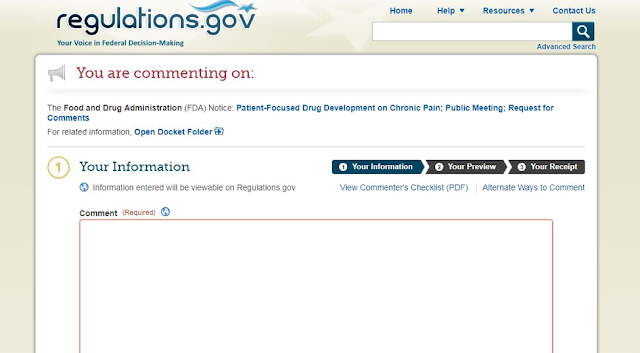 Go to the FDA’s online portal for submitting electronic comments to submit feedback at https://www.regulations.gov/document?D=FDA-2018-N-1621-0001 and click on “Comment Now” at the right of the page. Tell the FDA about RLS, how you manage your symptoms, and what kind of barriers have affected your access to treatment. You can use the suggested discussion topics below to inform your comments. b. What factors do you take into account when making decisions about selecting a course of treatment? How well does your current treatment regimen manage your chronic condition? What are the most significant downsides to your current treatments, and how do they affect your daily life? What challenges or barriers to accessing or using medical treatments have you or do you encounter? Electronic comments must be submitted on or before September 10, 2018. Make sure to let the RLS Foundation know you participated in this campaign! Isabella has been an RLS Foundation member since 1998. I'm sitting in the concert hall, the show will soon begin. The orchestra is tuning up - the horns and first violin. He looks at me as if he thinks that I might be contagious. My PLMD gets so bad, I have to leave the place. And I'm outside, lamenting all the music that I've missed. Before the next. Whate'er I try, I never can arrest it. Because my legs don't understand the seat belt sign is lit. She wonders if, when she gets home, she'll need inoculation. She looks away, uncomfortable, and then she starts to doze. I eat a snack, recline my seat and try hard to relax. Than pilots flying through a wind storm might experience. So now let's say I stay at home. I have some time that's free. I'd like to knit, do puzzles or compose some poetry. My legs soon start to twitch as if they want to run away. And jerk. It acts as if it were an independent thinker. And if I had some booze, I might become a heavy drinker. I shuffle pillows, toss and turn, then lie this way and that. The dog jumps off my bed and slinks forlornly to his mat. Because I know the old routine when I must go to bed. I read a gentle novel or I listen to some Bach. To see how many minutes of that twitching might have passed. I wonder if each spasm will turn out to be the last. So now of sleep I've been deprived for over 40 years. The energy that comes from rest, of which I've been denied. I'd find it quite impossible to deal with my affliction. Will use up far more energy than simple gratitude.